A wrongful death suit in the amount of $10 million is causing the details of a 2016 crash at S. New Era Road and S. Central Point Road to resurface. According to Clackamas County Sheriff's Office records, Amber Asaro was an employee of Clackamas County Health, Housing and Human Services at the time of the crash south of Oregon City. On Sept. 26, 2016, she was driving a Clackamas Health van southbound on S. Central Point Road. Dona Suek, 54, was a client of Clackamas Health and a passenger in the vehicle. A complaint filed in court alleges that Asaro did not slow or stop for the stop sign at the intersection with S. New Era Road, and at more than 42 miles per hour, drove the van across S. New Era Road and directly into oncoming traffic, where it was struck at a "high rate of speed" by a Toyota Land Cruiser. The 2016 Sheriff's Office report affirms Asaro did not stop, lists Asaro's speed at "at least" 42 miles per hour, and indicates the Land Cruiser was driving 36 miles per hour at impact. Dona Suek sustained fatal injuries in the crash and was pronounced deceased at the scene. Now, Dona's relative and representative of her estate, Travis Allan Suek, is claiming negligence and wrongful death and is suing Asaro, Clackamas County and Clackamas Health with a prayer of $5 million for Dona's suffering, $5 million for Dona's family members' loss, $4,785 for funeral expenses and costs incurred during legal proceedings. 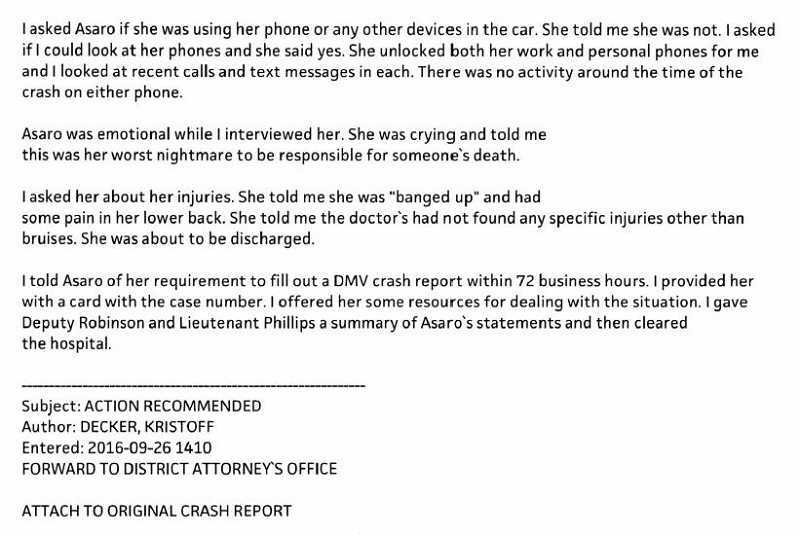 Deputy Kristoff Decker interviewed Asaro at Oregon Health and Science University hospital immediately after the crash, according to the 2016 Sheriff's Office report, where she told him she had been taking Dona, her client, to Dona's house in Canby for mail as proof of address, and that Dona was living at a shelter in Portland. Asaro told Decker Asaro was unfamiliar with the roads, so Dona was giving her directions; at the intersection, Dona said they could go straight or turn right. Asaro told Decker she was focusing on a "Canby" sign ahead and deciding whether she should go straight or turn, and she failed to see the stop sign. By the time she saw the sign, she told Decker, "It was too late." "Asaro was emotional while I interviewed her," Decker wrote in his report. "She was crying and told me this was her worst nightmare to be responsible for someone's death." The report, a collaboration from several police officers, found Asaro did not appear to be under the influence of any intoxicants and that there was no activity on her phones at the time of the crash. In the report, Officer Byron Oneil noted the stop sign was in the shadows, but the sign was easy to see and not in "deep shadows." He concluded, "There are no visibility issues due to the environment or roadway that would have caused the driver to not see the stop sign." Ultimately, the Sheriff's Office referred the case to the District Attorney to decide whether or not to prosecute Asaro. According to Chris Owens, Chief Deputy District Attorney, the office rejected the case in February 2017, finding insufficient evidence for criminal liability on the part of Asaro. Court records show Asaro was neither cited nor charged. Travis Suek's attorney Marc Johnston of Johnston Law Firm filed the complaint and request for a jury trial in Clackamas County Court on Jan. 24, 2019. In order for the case to go to trial, all defendants must answer. According to a Clackamas County Court clerk, the defendants all received the complaint on Jan. 29-30, but none have answered. If the defendants do not answer, Travis Suek can file for a default, the clerk said, after which a judge will determine whether the case will be allowed to go forward. Johnston and Travis Suek declined to comment on the case at this time.